What is the Hawai`i Prescription Monitoring Program? 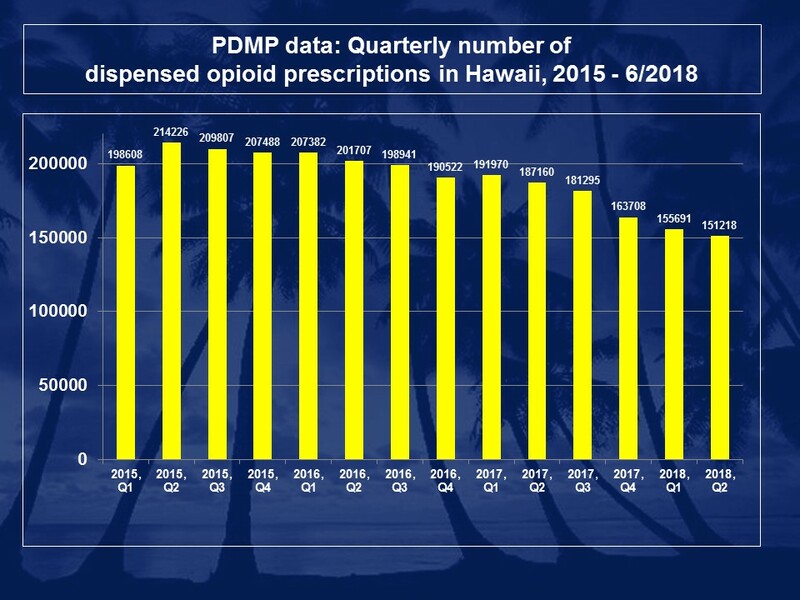 The Hawai`i Prescription Monitoring Program (PMP) is an online system that allows medical providers — both prescribers and pharmacists — to monitor patients’ prescriptions for Schedule II-IV controlled substances, to help prevent prescription drug misuse, and improve quality of care.While PMPs alone are not enough to reduce overdose rates or deaths, they are among the most promising clinical tools available to address prescription drug abuse (DHHS 2013). They have been shown to improve clinical decision-making, reduce doctor shopping and diversion of controlled substances, and help curb the prescription drug abuse epidemic. Who Can Use the PMP? Licensed prescribers and pharmacists can Register Here to gain access to this free online system. Why Should Prescribers Use the PMP? What is the Concern for Hawai`i? In recent years, drug poisonings have surpassed motor vehicle crashes as the leading mechanism of injury death in Hawaii. Each year in our state, drug poisonings are responsible for an average of 155 deaths and 4,500 hospital treatments. Pharmaceutical opiates are involved in at least 41% of fatal drug poisonings and 12%-20% of nonfatal drug poisonings. Centers of Excellence for Physician Information (NIH) — Course materials on a diverse set of topics, including prescription drug abuse, created through a partnership between the National Institute on Drug Abuse (NIDA) and eight medical universities. Act 151/House Bill 1602 Effective 08-01-18. Requires the inclusion of a label warning of the risks of addiction and death on the packaging of any opioid drug dispensed by a health care professional or pharmacist. Act 154/Senate Bill 2247 Effective 07-09-18 Authorizes pharmacists to prescribe, dispense, and provide related education on opioid antagonists to individuals at risk of opioid overdose and to family members and caregivers of individuals at risk of opioid overdose without the need for a written, approved collaborative agreement; subject to certain conditions. Medline Plus (NIH) — Facts, tools, resources, and references that address the problem, diagnosis/symptoms of addiction, treatment, prevention/screening. Facing Addiction – The Surgeon Generals Spotlight on Opioids September 2018 The Spotlight on Opioids assembles opioid-related information from the Surgeon General’s Report on Alcohol, Drugs, and Health into one document to better inform the general public, especially family and friends of people with an elevated risk of opioid overdose, opioid misuse, and/or opioid use disorder. Opioid Overdose Prevention Toolkit – 2014 (Substance Abuse and Mental Health Services Administration) — Aimed at communities and local governments, this kit includes materials to develop policies and practices to help prevent opioid-related overdoses and deaths. Addresses issues for first responders, treatment providers, and those recovering from opioid overdose.